Working in chilly settings calls for specialised gloves that shield not only from all the most common hazards, but cold as well. While keeping your hands comfortable is crucial for your safety and productivity, staying warm throughout the day is just as important. The Hotteeze Self-Adhesive Heat Pad (Pack of 10) is a practical and cost-effective solution that will get you toasty warm within minutes and continue to release warmth for up to 12 hours, making sure you can work without having to think about the cold. This purchase includes a pack of 10 heating pads; the Hotteeze Heat Pad is also available in individual pads for greater convenience. The Hotteeze Heat Pad can be used to provide general warmth and comfort on any part of your body. Stick it to your chest, back, shoulders or abdomen when working in the cold, and stay warm for up to 12 hours. Its sleek, ultra-light design ensures you can easily wear it under your jacket or even a jumper without anyone noticing. Featuring a self-adhesive backing, the Hotteeze is convenient to apply to clothing without the use of adhesives or tapes. Ultra-light and odourless, it is unobtrusive in use and provides warmth discreetly. Ten minutes after application, Hotteeze will begin to produce heat at an average temperature of 50°C (122°F) and will continue to work for 12 hours. The Hotteeze works via a chemical reaction that utilises biodegradable natural ingredients. This means that, once a pad has been used, it can be simply thrown away in your garden, guilt-free! The contents can be reused as a soil conditioner, contributing to the reduction of wastes, while the outer packet is combustible and does not generate toxic gases. 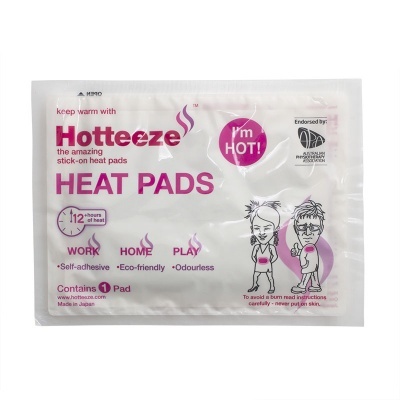 Please note that the Hotteeze Heat Pad should never be applied to bare skin. Always read the instructions carefully before use.